Struck down by the resurgence in world financial markets and lung-blight from an ill-advised trek through Whitechapel at midnight, hence no film reviews for another week. I have, however, been watching lots of stuff and will update as soon as I can, chaps. In the mean-time, here's a shameless plug for the DVD/Blu-ray release of MOON. I don't normally accept cine-swag, nor take the company shilling, but in this case I'm making an exception. MOON is an exceptionally good sci-film film - all the more astounding because it's a debut feature and made on such a low budget. It's the sort of film that reminds you how good cinema can be when it's all about ideas, characters, and a proper narrative arc, not to mention a bravura performance from Sam Rockwell. So, if my opinion's worth anything to you, please do check it out, and read the full length review here. Doesn't come out on DVD here for quite a while, but I did see Moon a couple of weeks ago. Really liked, definitely want to see it again. So much plugging Bina! LOL, but Moon is the kind of film that elicits this kind of fanship. So justified! 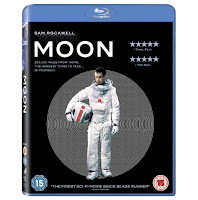 Big shout from another Moon aficionado (Can we have two Oscar nods atleast: one for Rockwell and another for Mansell's score)!